Not content with cuts to pathology and diagnostic bulk-billing, the Turnbull government has resuscitated Tony Abbott’s plan to privatise Medicare payment systems. But these twin attacks on Medicare could prove to be Turnbull’s major mistake. The government is in for a fight, with the first “These Cuts are Killing Us” rallies, widely backed by the union movement, hitting the streets on 20 February. Reports confirm that the $50 billion privatisation is very likely to be a part of the May budget, with private accounting multinationals like KPMG already writing up the “business case” for privatisation, and the Department of Health preparing for a trial. Turnbull and Health Minister Sussan Ley are using Turnbull’s cringe-worthy spin about the “digital revolution” to declare they are bringing Medicare payments “into the 21st century”. But their plan is to pay a private provider to upgrade the payment systems for Medicare, the Pharmaceutical Benefits Scheme and aged care. As CPSU National Secretary Nadine Flood explains, “This privatisation could threaten thousands of jobs, particularly in regional Australia.” Personal health information would be at the mercy of private companies. Australia Post has expressed interest in taking over the system, which could be part of preparing the ground for its own privatisation. Major companies like eftpos, the big banks and even the infamous detention centre contractor Serco are also reported to be circling. The privatisation will not save money; it will simply mean taxpayer money going to private profits. A similar process has been a catastrophe for NSW TAFE, with costs blowing out to $500 million dollars for an IT upgrade led by private company Accenture. It has been such a disaster that many students cannot even enrol in courses. There is no reason why an upgrade to the payment systems should be done by a private company. It could easily and much more effectively be done in-house. Across the country, unions are gearing up to make the attacks on Medicare an election issue. Polling organised by unions shows nearly 70 per cent of people in marginal seats are opposed to the pathology cuts. These cuts will see patients paying upfront for widely-used services; in some cases, the out-of-pocket costs will be enormous. Already, the two major private pathology providers are trialling co-payments for pathology and diagnostic services, though the cuts don’t go to the Senate until July. “We are hearing every day from members of the community just how angry they are at any attempt by government to take us down the US-style path of health care,” said Ged Kearney, ACTU President, launching a union campaign to Save Medicare. An ACTU meme about the cuts was shared two million times on Facebook. But we’ll need more than social media and doorknocking in marginal seats. The 20 February rallies will be a great opening shot for a sustained campaign, with hundreds of organised workers joining in. We can follow up by building local committees, workplace meetings, and organising for major mobilisations around the budget itself. 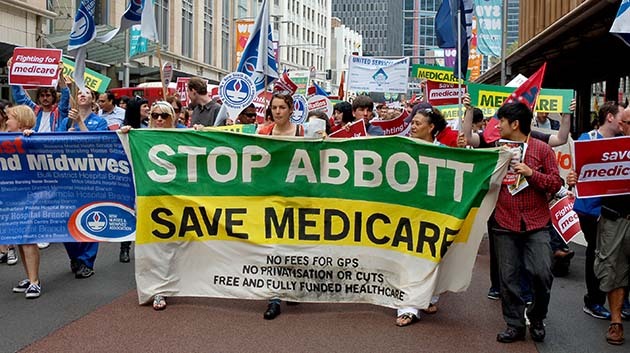 The movement against the GP co-payment was part of what made Tony Abbott toxic. It’s time to subject Turnbull to the same treatment. Diabetes professionals are aghast at the pathology cuts, fearing they will mean their patients skipping vital tests and ending up in hospital. Tests to manage Type 2 Diabetes will cost a minimum of $16.80 + $9.70 four times a year, not including extra charges by pathology providers on top of the rebate. During pregnancy, innumerable tests can be required by GPs, depending on the mother’s history and the risk of complications. Each individual test might not seem so expensive (for example, quantitation of bile acids in the blood in pregnancy, $19.65) but this would really start to add up over multiple tests. Some tests will be extremely expensive. An electron microscopic examination of biopsy material will be at least $184.35. Genetic testing, which is increasingly used to assess things like cancer risk, can be several hundred dollars. For example, chromosome testing has a fee of $394.